Pakistan Youth Outreach (PYO), in collaboration with Karakorum Expeditions, proudly initiated national women winter expedition to an unnamed, unclimbed peak, for the first time in Pakistan’s mountaineering history. 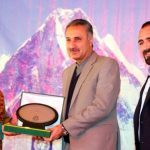 The National Women Winter Expedition was lead by the renowned and only female Mountaineer of Pakistan to summit Mt. Everest, Ms. Samina Baig. The expedition was initially planned to 6050m Peak in the Shimshal Pamir region, known as “Mingligh Sar”; however, due to some logistic issues the plan was changed and decided to ascend an unnamed and unclimbed peak in the Boisom pass in Gojrave, Shimshal Valley (Upper Hunza, GilgitBaltistan). The peak was never climbed in the past even in the summers, however expedition in the winters is quite challenging and harshest weather conditions and never attempted. This expedition was launched under the slogan of women empowerment, to encourage gender equality and unity amongst the youth/women across Pakistan. Women winter mountaineering is symbolic for breaking barriers and stereotypes that are prevalent for women in Pakistan, it is aimed to encourage young Pakistani women to pursue mountaineering as a career choice and embark on such challenging & unconventional outdoor sports endeavors. The expedition campaign was announced on social media and women from all over Pakistan were invited to participate, with the plan to select one representative from each area, Sindh, Punjab, Balochistan, KPK, AJK and Gilgit-Baltistan. There were total four local girls finally selected from Pakistan and due to nature of the expedition to be one of its kind, two international women from USA and Norway also joined this historical event. International women participation enhanced cross culture understanding and unity and peace through outdoor sports, and showcased positive side of Pakistan around the world. The women winter expedition was first of its kind in Pakistan’s outdoor and mountaineering history, as before commencing the expedition there was a weeklong extensive basic mountaineering camp at Malangudi Glacier Shimshal. The purpose of training camp was to guide, educate and train the female participants for the expedition and to improve their technical and emotional skills before embarking them on such serious and extreme conditions. After the weeklong training, the team was all set to start the expedition to Mingligh Sar, however due to lack of availability of porters the plan was changed to next best available option of summit of an alternative unclimbed 5000m+ peak. 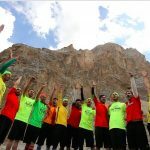 At day first, starting from Shimshal village, after 5-6 hours continuous hike, the expedition’s first stop was at Zathgruben which is also world’s highest sports arena at 4,100m, and where the team acclimatized for a day. On the next day, the women team hiked to Vayn Sar Pass at 4,700m which was so far the highest point that any member of the women winter expedition team had ever summited. At Zathgruben, one of the member named Aafia Younis suffered knee injury due to which she had to decide to leave the expedition. On day third, the rest of the team started their journey in high spirits & best of the health to the base camp, which is at 4,446m, and stayed there for 3 days during which they hiked in the surrounding area for acclimatization. Finally the day arrived for departure to High Camp, which was setup in Boisam Pass at around 5,000m. Finally four members named Bismah, Komal, Siv and Samina were able to make it to the high camp as rest of the two members named Ariana and Sadaf had suffered health & altitude issues. The weather conditions at the high camp were very severe with cold air & temperatures in the range of -35C-40C. On the summit day, Samina Baig and Dr. Siv were fit to start the summit along with our high altitude guides Eid Muhammad, Gul Muhammad & Arshad Karim. Rest of the team had also suffered from altitude sickness. The 5 members summit push started at 9:30 am and in 6 hours at local time 18:30 pm, after continuous extreme vertical climb and combating harsh winter temperatures, Dr. Siv and Samina Baig had finally achieved the historical & momentous summit, which was recorded to be at a height of 5,600m. The previously extreme winter conditions, which is a proud moment in the history of Pakistan’s mountaineering. Mohammed Eid who is an experienced high altitude guide and had also been part of K2 expedition & climbed till Camp 3, mentioned it to be a very tough and technical peak and equivalent to K2 Black pyramid in technical difficulty. The women expedition team under extreme winter conditions finally conquered the previously unclimbed & highly technical peak, which is a proud moment in the history of Pakistan’s mountaineering. The peak is proposed to be named as Koh-e-Zamiston or ‘Winter Peak’, to mark it’s significance of first ever summit in winter. Under the leadership of Samina Baig, the women winter expedition has proved that there is a bright future for young Pakistani women in the field of mountaineering, and that they are capable of breaking barriers and setting new standards in this field. This expedition is just the beginning of many more successful endeavors to come, and Pakistan Youth Outreach along with Karakorum Expedition is working on such similar future expeditions/projects for women empowerment in the filed of mountaineering in Pakistan.